The PRSONAS digital personalities automatically and intelligently interact with customers through built in motion sensors, proximity sensors, artificial intelligence and an easy to use touchscreen interface. PRSONAS units can deliver marketing messaging, conduct commerce transactions, deliver live video chat support and collect user analytics data. 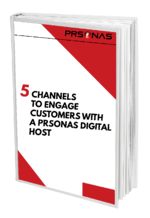 The PRSONAS Design Factory allows brands and agencies to quickly and easily update the look, voice, graphics and end user experience of their PRSONAS smart virtual presenters through a cloud-based portal.